This is 8 of the original founding Dread Pirate copies. There are, and forever will be, only 10 Dread Pirates. One is unphotographed and one is still in the design phase. Meanwhile, the end of the fulfillment stage of our Kickstarter is nearly complete. Only 7 backers are still awaiting their awards! Expect a detailed update when the campaign is complete. We’ve been documenting the entire process so expect a more detailed write-up once we have all our orders fufilled. Two years of dreams came true yesterday, Yargo’s brass coins arrived from the mint! Each coin is hydraulically stamped from a brass plug so the brilliant golden gleam isn’t a finish. We’re super pleased with how they turned out and we think you’ll agree they make for a great coin flip. It’s a pirate’s dream! Salior rewards will go in the mail next week. Shipbuilder rewards will be sent before the end of September. 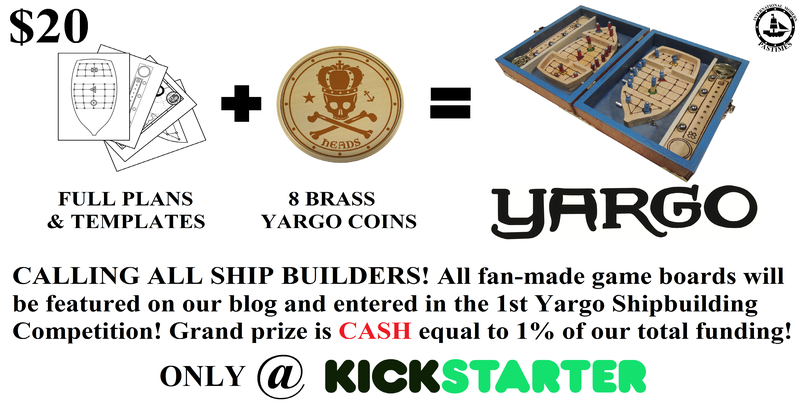 With Shipbuilders, Yargo Building Contest details will be announced. Sneak peak at 2nd edition Yargo! WE DID IT!!! 104% FUNDED SO FAR! 😀 Wow. I’m speechless and deeply grateful to everyone who’s supported us so far. Only 3 days left to reserve your copy if you haven’t gotten one yet. We had a lot of people wondering where the middle price range version of Yargo was. Until a week ago, we hadn’t come up with a solution we were happy with. For artistic reasons, we don’t plan on ever making a cardboard/plastic version of the game. We considered making a flat engraved version but storing the pieces separately just bugged us. Then we had this idea.The a simplified, Mancala-inspired, folding design can hold all its pieces internally when closed. Best part: we estimate we can get this version in the $25-50 range, depending on volume and shipping! 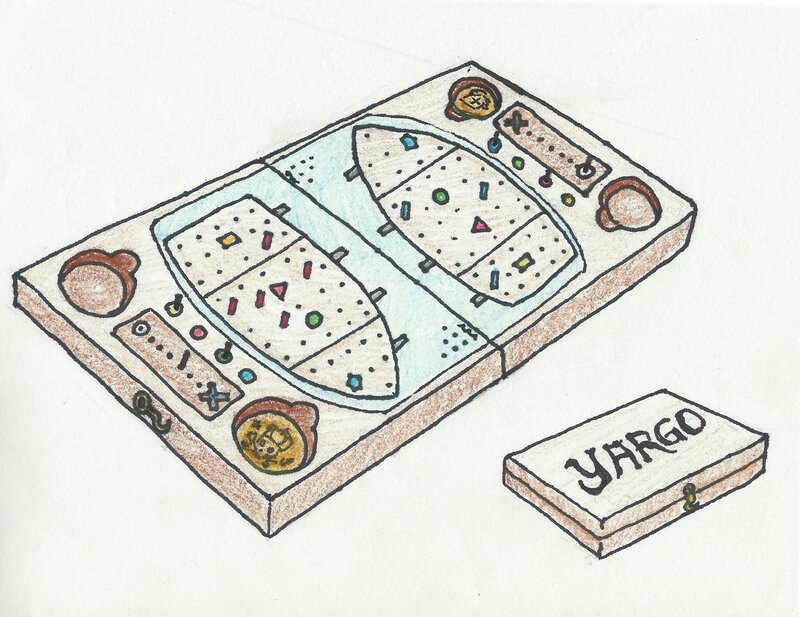 This was inspired by Andrew’s Mancala board, we used to have a lot of fun taking that thing to a restaurant or coffeshop, but of course, now we’d rather play Yargo. If you haven’t tried taking a travel gameset along on an outing before- you’re in for a real treat. And you’ll understand why we used magnets! -> It’s easy! Kids have no problem flipping coins, why should you? For those with a flipping disability, there are plenty of easy alternatives: flip into a bowl, odd or even on a die, and plenty of coin flipping apps. The best proof is a live example: in this short (<2 min) video, we compare a turn firing cannons in a “Broadside” action (no flips required) versus firing cannons individually (max of 3 flips per cannon). You can see both tactics have there own advantages and coin flipping doesn’t disrupt the flow of the game.